Let's talk about what colors you can get using Henna. Tonight I got a great question regarding Henna colors. Here is some information to help you decide on the right color choice for you. With 100% all natural Henna, the color you get will always be red. You can mix other natural ingredients into the mix to get other variations, but it won't be purple, blue or anything crazy. Henna makes Red. You can get Brown by mixing other ingredients, and black is also possible by using Indigo but Henna is not going to give you an unnatural color! HENNA FACT: Henna is a plant, not a chemical, or ink. Henna is a natural plant, and it grows in very hot climates. As a natural plant it makes only one color: orange-reddish tones. Typically blueberries stain blue, just as henna stains red. Henna powder is mixed into a henna paste, which can be used to dye your hair 'permanent until it grows out', or to create henna body art designs 'temporary' on the skin. People also use Henna to dye fabrics, or do nail designs. 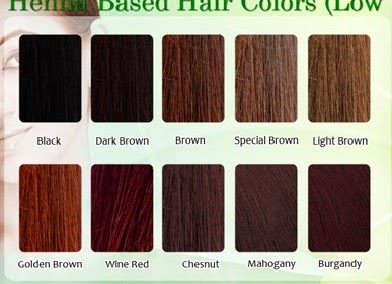 Some Henna hair dyes contain other things, and are not actually all natural. Look for the plant based ingredients such as Indigo to make the color darker. You can also somewhat alter the color of your Henna by adding other things when mixing. Such as lemon juice (the acid makes it more orange), Red Wine, or Red wine vinegar (this will make a darker red), and tea or coffee to get a more auburn or brown look. The great thing about Henna dye is that it's a way to have natural looking hair without really being a natural red head. You can have light hair, and dye your hair black or brown using Henna with Indigo, and no one would know it was not your real color. The only give away would be the roots. I've noticed because Henna sticks to the follicles of your hair, the roots are very subtle, and you can't really tell right away. Another good thing to note, is that Henna will NOT lighten your hair. Henna is chemical free, and it's all natural, so it contains no bleaching quality's. However, if you have bleached your hair, and it's starting to grow out, you can get a beautiful strawberry blonde color by using Henna over the bleached hair. So if you are wanting a vibrant RED RED, like fire engine red, then I am going to say Henna won't work for that look. Because it's a plant, it's going to give you a natural looking red... However with that being said, that does not mean you can't dye your hair fire engine red, wait a few weeks and then dye with Henna. If you do this, the intensity will not be as bright, but Henna will keep the red from fading, and have a much easier upkeep with no bleeding out like chemical dyes. Remember though once you dye hair with Henna, you can't get rid of the Henna, so make sure it's what you really want before you make that long term commitment!. Got questions? I got answers! Comment below and follow me on Facebook and Twitter.